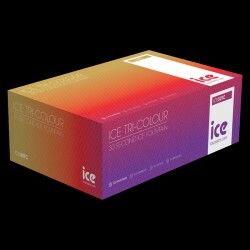 The Tri-Coloured Ice Fountain in the newest ice fountain addition to our range. The tri-coloured version changes colour three times during its burn. Starting off with the standard gold, to a deep red and finally finishing with a cool purple effect. 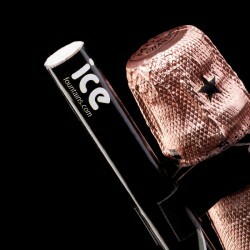 This product is a showpiece on its own! This product burns with a three coloured flame for approximately 30 seconds and produces a higher level of smoke and odour than our other ranges. The most common use for these ice fountains is to insert into small cakes and desserts, like cupcakes and birthday cakes. We currently supply this product around the UK to cake companies and bakeries for resale purposes. This product conforms to European standards EN 14035-15. 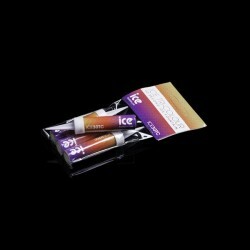 1 pack of miniature Tri-Colour 30 second Ice Fountain Cake Sparklers. Three colour changes during burn. Ideal for use in cakes and desserts. This product conforms to European standards EN 14035-15. 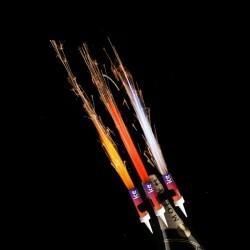 1 box of 60 (20 packs of 3) miniature Tri-Colour 30 second Ice Fountain Cake Sparklers. Three colour changes during burn. Great for cakes and desserts. Give that cake the attention it deserves. This product conforms to European standards EN 14035-15. 1 case of 240 (4 boxes of 60) miniature Tri-Colour 30 second Ice Fountain Cake Sparklers. Three colour changes during burn. Ideal for use in cakes and desserts. A fantastic product for all dessert suppliers. This product conforms to European standards EN 14035-15. 1 pack of 4 miniature Tri-Colour 30 second Flaming Flares. Three colour changes during burn. Ideal for use in special cocktails and desserts. This product has no sparks and emits a bright coloured flame effect only which resembles a flame thrower. 1 box of 60 (20 packs of 3) miniature Tri-Colour 30 second Flaming Flares. Three colour changes during burn. Ideal for use in special cocktails and desserts. This product has no sparks and emits a bright coloured flame effect only which resembles a flame thrower. 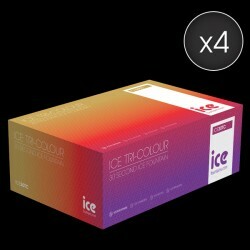 1 case of 240 (4 boxes of 60) miniature Tri-Colour 30 second Flaming Flares. Three colour changes during burn. Ideal for use in special cocktails and desserts. This product has no sparks and emits a bright coloured flame effect only which resembles a flame thrower.